Have you ever wondered exactly how airplanes fly? How do they seemingly defy the laws of nature by overcoming the powerful force of gravity? Ever since the Wright Brother plane, people have been mystified by this question. It's natural to see a bird gliding through the sky. But sometimes it's hard to imagine that a huge chunk of metal like the Air Bus can float through the air! To understand how airplanes fly it is important to have a basic understanding of the laws of physics. 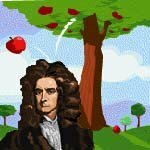 Sir Isaac Newton (1642-1727) was by far one of the greatest scientists in the history of mankind. Although he was long gone before the invention of the airplane, that doesn't mean that he didn't play a key role in inventing the airplane! There are three simple laws that he discovered that govern the motion of every object in the universe. In order to understand how airplanes fly, we have to start with Newton's three laws of motion. Don't worry, this is not school, there's no test to pass! An object at rest will stay at rest and an object in motion will stay in motion with the same speed and in the same direction unless acted upon by an unbalanced force. An object will accelerate when the forces acting upon it are not balanced. The greater the mass of the object being accelerating, the more force it will take to accelerate the object. In order to understand how airplanes fly, we need to take a look at all of the forces that are acting on an airplane while it's in the air. According to Newton's first law, if these forces aren't balanced the airplane will accelerate in the direction of the highest combined force. A force is basically a push or pull in a specific direction. Pressure acting on an object can be thought of as a bunch of small forces acting over certain area. Force = pressure x area. There are four forces that are acting on an airplane at any given time. These are lift, weight, drag, and thrust. Refer to the diagram to the right as we learn about each force. 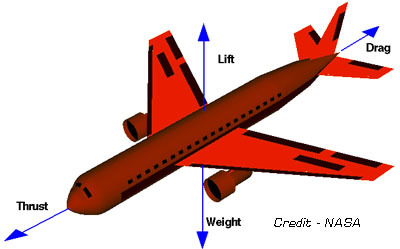 The factors that determine lift are the shape of the airfoil, the surface area of the wing, the angle of attack, and the speed of the airplane. A Dutch scientist by the name of Daniel Bernoulli (1700 - 1782) discovered that as the speed of a fluid increases, its pressure also decreases. This same principle applies for airflow over an airplane wing. This is known as the Bernoulli's Principal. Have you ever been cruising down the expressway with the windows down and all the sudden a loose plastic bag or piece of paper gets sucked out of the window? 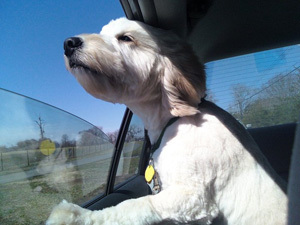 Since the air moving past the window is moving faster relative to the air inside the car, its pressure is much lower than the pressure inside the car. For this reason the bag is pulled to the low pressure and out the window it goes! But what does this have to do with how airplanes fly you may ask? Take a look at the cross section view of this airplane wing below. 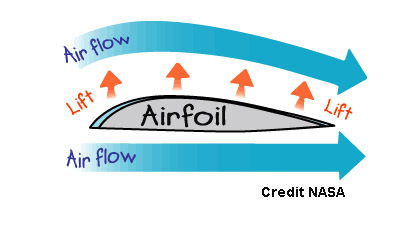 This cross section is referred to as an airfoil. When the air hits the leading edge (front of the wing), some of the air goes over the top of the wing and some of the air goes under the wing. As I'm sure you're well aware, the shortest distance between any two points is a straight line. You can see that the air going under the wing travels a shorter distance before it gets to the trailing edge. The air going over the wing travels a longer distance before it makes it to the trailing edge. Both the air going over the wing and the air going under the wing go from the leading edge to the trailing edge in the exact same amount of time. The only way this is possible is if the air going over the wing is going faster than the air going under the wing. When this happens, the air pressure on top of the wing becomes less than the air pressure on the bottom of the wing. Since force = pressure x area we have more force pushing up on the wing than we have force pushing down on the wing. As a result, we have lift! 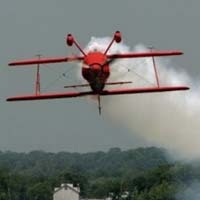 If this theory describes how airplanes fly, are you wondering how airplanes fly upside down or inverted? The shape of a wing's airfoil is a key factor that determines how much lift the wing will produce. It has a great impact on how airplanes fly. However, the shape of the airfoil is only one factor that determines lift. The second factor that determines lift is the angle of attack. This is the angle that the wing is tilted upward relative to the flight path of the airplane. When the front of the wing is raised up, it deflects the air passing by downward. According to Newton's third law, the air must in turn be pushing the wing up. This is lift! Take a look at the graph above. As the angle of attack increases, so does lift. But when the angle of attack gets too large, the airplane will stall. A stall means that the airplane is no longer flying, it's falling! Weight is a force that pulls the airplane straight down. The weight is actually distributed throughout the entire airplane. However, the weight can be thought of as a single force acting on the center of gravity. The center of gravity is the point at which the airplane balances both laterally and longitudinally. When the airplane is in flight it actually rotates on all three axes about its center of gravity. When an airplane is flying, it encounters air resistance. This air resistance is called drag. Drag can be thought of as a force pulling the airplane's tail backwards. The shape of the airplane, how fast the plane is moving, and the surface texture all contribute to the magnitude of drag. In order to get airborne, the airplane must be moving fast enough for the air moving over the wings to produce lift. The force moving the airplane forward is called thrust. Think of thrust as a force pulling the airplane towards its flight direction. Thrust is provided by the propulsion system. This could be a single engine propeller, multiple engine propellers, a turbine(jet) engine, or even multiple turbine engines. Scroll up and take another look at Newton's first law of motion. Since we are learning how airplanes fly, pay particular attention to the second part of this law. Pertaining to an airplane, this means that the speed and direction of an airplane will not change unless the forces acting on it are unbalanced. When the thrust is greater than the drag, the forces acting on the airplane are unbalanced. When this happens, the airplane will begin to accelerate. 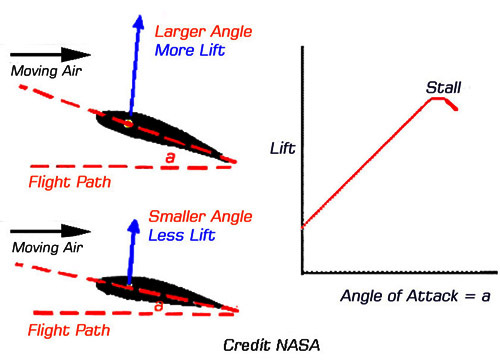 When the airplane accelerates to a sufficient speed, the airfoil and the angle of attack of the wing will produce more lift than the airplane weighs. When the force of lift is greater than the force of weight the airplane begins to fly! Now that you know how airplanes fly, learn how flight control surfaces produce forces to steer airplanes in specific directions while in the air.